From the Book, “What the World Eats” by Peter Menzel and Faith D’Aluision. This family represents Mexico. 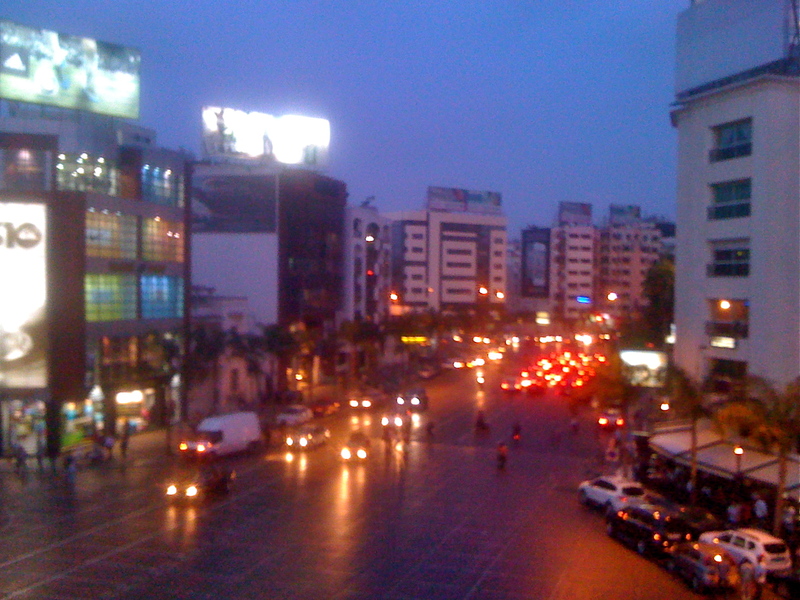 In Casablanca, I tutored a Coca-Cola executive. He told me they’d run an experiment to see how people of different economic classes spend their lunch money. They gave 20 dhs, roughly $2.30, to a few people with the goal of buying lunch for their family. The wealthiest participant balked: what would 20dhs buy – hardly even a sandwich! The middling participant managed to do just that – to find a satisfying lunch for himself only at 20dhs. The poorest of the three went to the souk. From the vegetable stand, she asked the purveyor to give her 5 dirhams of mixed vegetables appropriate for couscous. She bought 10 dirhams of chicken and with the remaining 5 dihrams, she bought semolina, spices and a little leben (buttermilk). For 20 dhs, the poorest woman fed her whole family lunch. The Coke executive told me that one of the people watching the experiment was from Atlanta. He said the woman started crying when she saw how much fresh, healthy food 20 dhs could buy, compared to what low-income folks in Atlanta had at their disposal. I’m lucky to live in a place where whole, fresh foods are cheap, local, and seasonal. Sometimes I groan about lack of variety (Mushrooms, please! Asparagus! ), but after looking at these photos, I’m so grateful the packaged items on my table are few. My wish for the world is what I’m already lucky to have: cheap fresh vegetables, meats and bread that goes stale quickly. Pops called me daughter, dropping the grand. Sometimes he called me oh girl. “Oh girl, oh girl, oh girl,” he’d say when he entered the room, and I knew he was talking to me. He had voice, and I loved him for it. But, I liked it best when he said “Just like New York.” He said it about anything fancy, or modern, or strange. He said it about people. He said it just to say it. Both Nannie and Pops had lived in upstate New York, and for a short time when Pops was in the army, Nannie lived close to New York City. I never knew exactly which New York he was referencing. But I was obsessed with living in NYC, so I liked to assume that’s what Pops meant. Every time he called something just like New York, I wanted desperately to know why he said it, to understand the comparison, to gain some insider knowledge. Most of the time, I was looking for meaning where there wasn’t any. This morning, while walking back to my apartment after my early lesson, I saw some graffiti on the gates of several closed shops. “Just like New York,” I said aloud, before I even realized what I was saying. *this was supposed to be an entry about Moroccan hip hop and graffiti. Whoops. 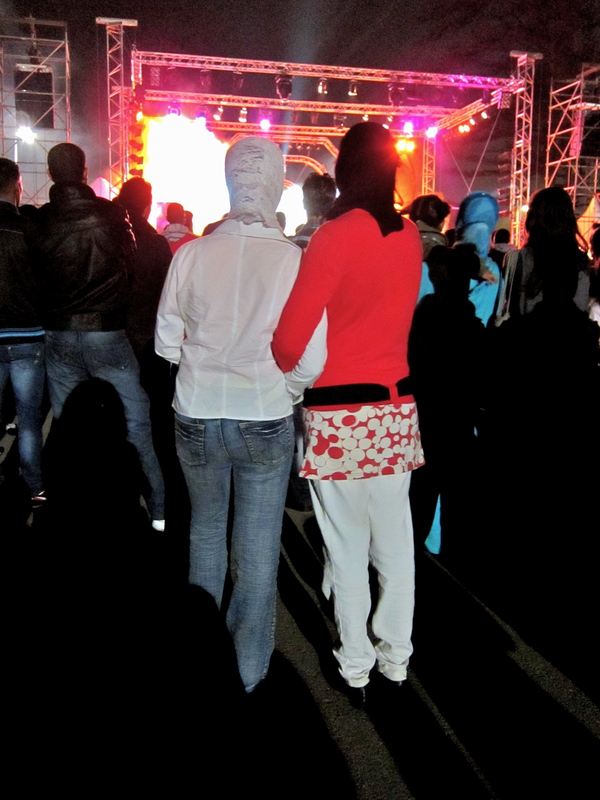 But click on this photo to check out some Maghrebi hip hop. Photo links to Bigg's (above, left) Mabightch, or Don't Want To. When I decided to move back to Morocco, I’d felt the need to justify my decision to everyone I knew, especially my friends and family in New York. How do you leave a city like that behind? Maybe you don’t. And maybe that’s what Pops was thinking to. Once New York City builds a miniature version of itself inside you, it’s hard to escape. So, I’ll keep looking for pieces of New York wherever I am. Because the similes bring me home. In Brooklyn there came the sound of the ice cream truck, maddening in its frequency and cheeriness, a sure way to recognize the summer season if the foul smell of garbage cans and the oppressive heat hadn’t already clued you in. There’s an equally irritating aural villain in my neighborhood in Casablanca: the cd salesman. 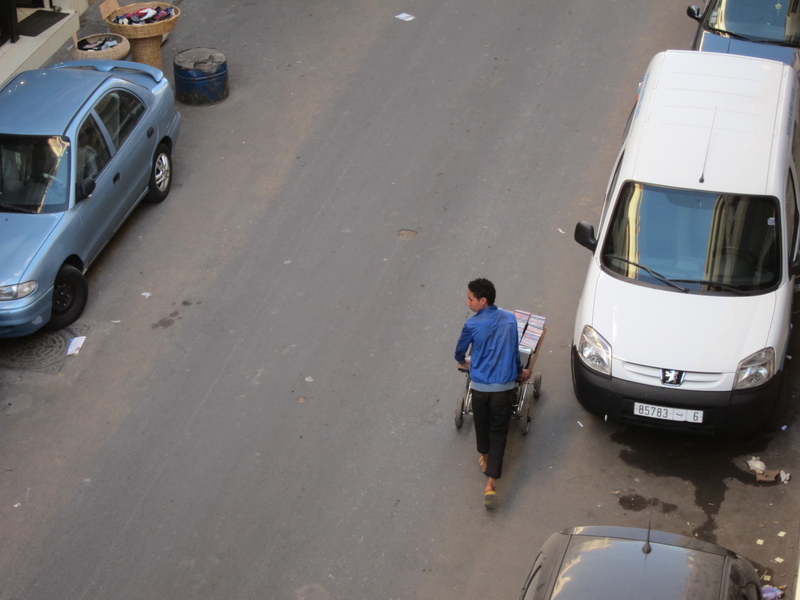 This gentleman pushes his music cart through Maarif’s busy grid, playing sample songs on a boombox with one loud speaker, hoping to entice nearby Moroccans. His song of choice this week is one for teaching children a blessing: “Bismillah, Bsmillah, in the name of Allah.” I took this for a good luck omen when I first moved in; bismillah is a blessing offered at the beginning of things, climbing stairs, for example, or beginning a meal, or getting into a taxi. But the music is boring. And eerily upbeat. And the singer has the high-pitched voice of a child of indeterminate gender. I’ll take an Egyptian habibi song over this any day of the week. But the very worst part is that each time he passes under my apartment, I hear an internal version of the ice cream truck melody. A particularly gruesome double torture, if you ask me. Sorry, fella. I'm up here shaking my fist at you. And just like that my extended sojourn from this blog is over. 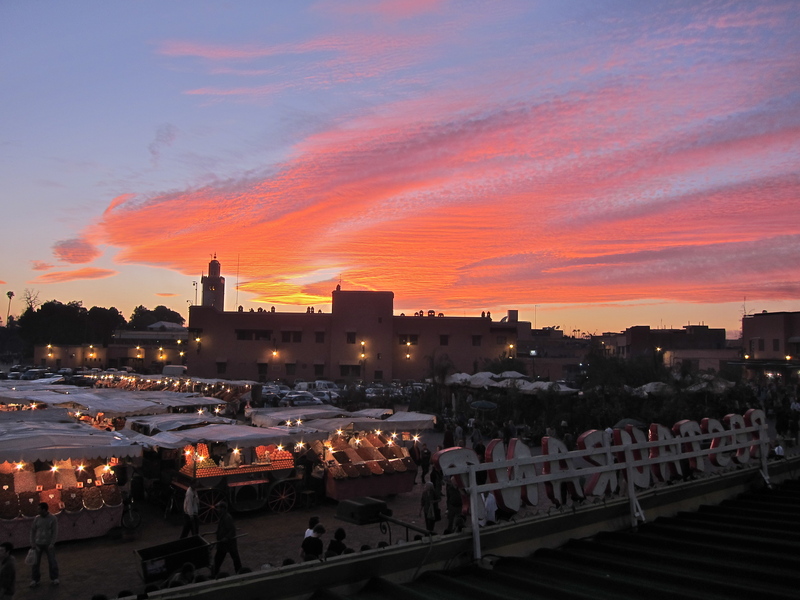 I’m back: in Morocco, on the internet, to teaching and to writing. And I’m excited. Maarif, my new neighborhood has a little of everything I loved about living in El Jadida – friendly hanut owners and fresh olives and vegetables down the block, and cafe nus-nus aplenty. 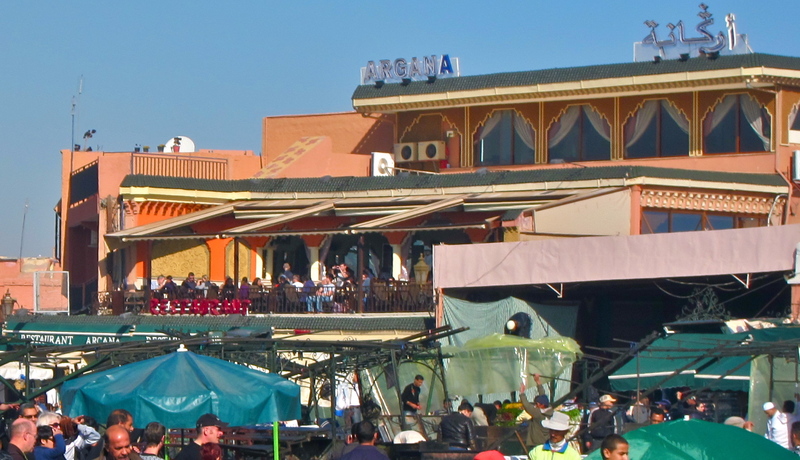 But it’s also on the edge of Casablanca’s upscale shopping district. It feels like a nice blend of New York and Morocco, which so far, has made life considerably easier than it was this time last year. I already speak enough Darija to get things accomplished by myself and when I can’t, there’s an incredible amount of proficient English speakers in the neighborhood to help me. So another year of exploration begins. I hope you’ll join me. I’d made a habit of sharing a chicken bastilla at the same table on Café Argana’s terrace each time one of my friends visited Morocco. “Of course you did,” a Moroccan friend said yesterday when we were discussing the bombing. “Everyone did. It’s the best. Everyone goes to Argana.” Then, he lowered his head and said: “It’s not right. How could someone do something so terrible? That’s not Islam. That’s not Morocco. I hope you know that.” I nodded and said I did and we resumed worrying: about his friend that worked nearby, about my waiter from a few weeks ago. And that’s what makes me so sad about Thursday’s events. This isn’t a country where bombs go off; it’s a place where people you’ve only just met invite you to tea or lunch and insist you eat until you’re stuffed. This is a country of amazing linguists. It’s a country of stories and storytellers. It’s a country where you can watch an evening come to life from a beautiful terrace. It’s a country where people laugh often, and laugh well. I’m so sad for Marrakech and the tragic events that occurred there Thursday. I’m angry that innocent people died, and that someone willingly marred the reputation and the tourism industry of a country that dearly loves and needs their tourists. 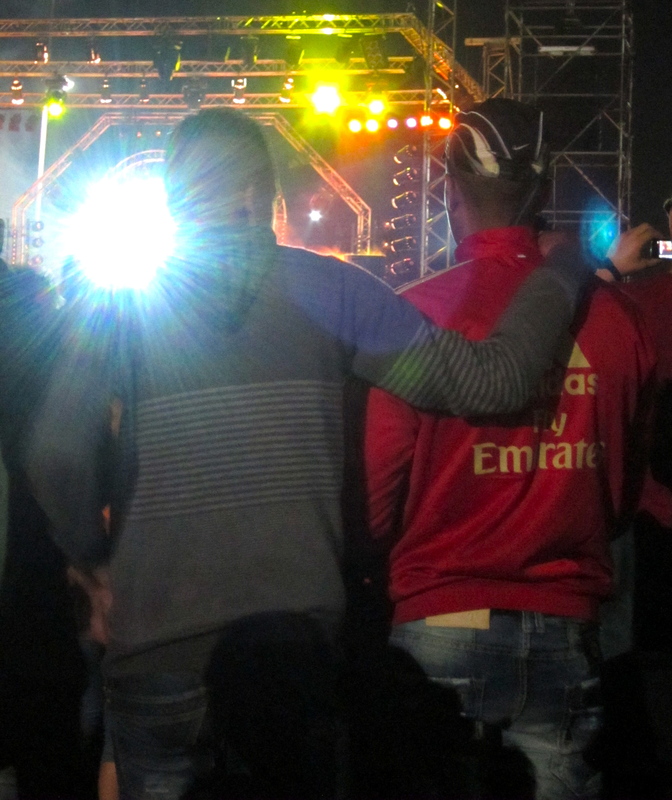 But I’m also confident in the wonderful Moroccans. They will rebuild and survive and the country will continue to evolve in uniquely Moroccan ways. They’ll show everyone that this is a safe and amazing place to visit. 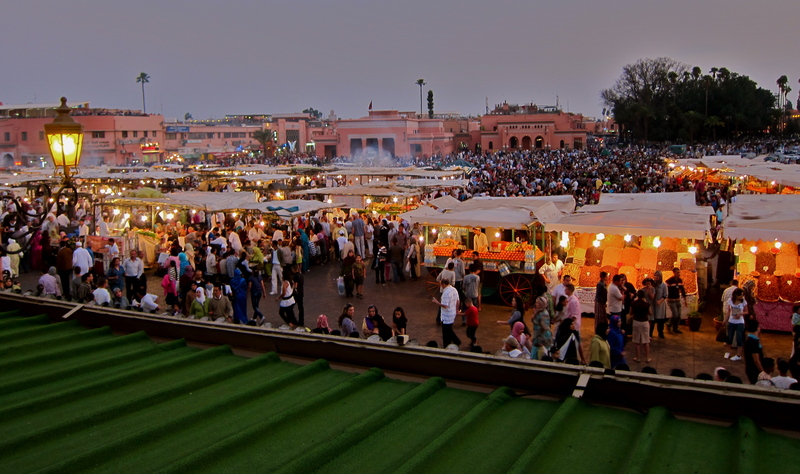 And, inshallah, the tourists will continue to swoon over smells and monkeys and the snakes and the storytellers and the performers, just as they have done for hundreds of years, because the spirit Djemaa El Fna has more power than any bomb. The sharqi blew the streets of Tangier and Tetouan clean. So we climbed into a grand taxi and blew ourselves away too. One hour of winding Rifian roads later, we found the sun hanging over a city washed with blue. 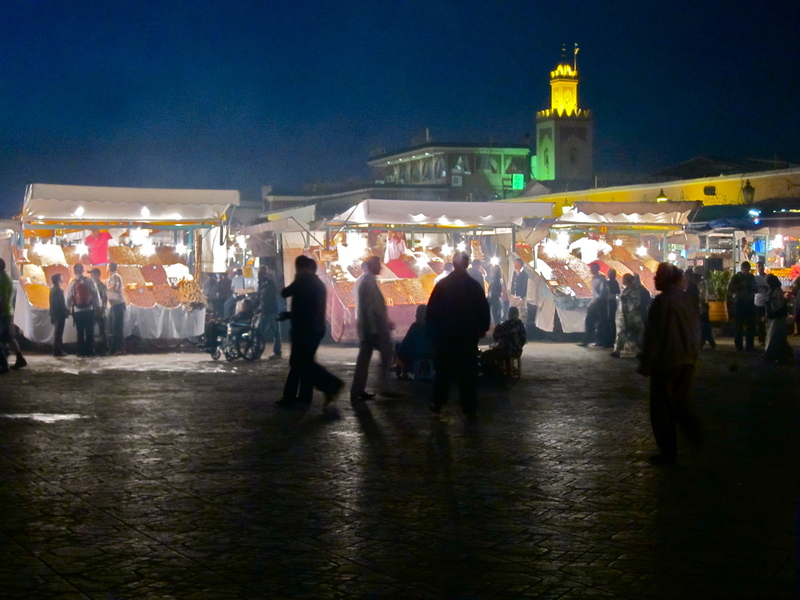 Joni describes the way I feel about Chefchaouen best: Ink on a Pen/Underneath the Skin/An Empty Space to Fill In.